I spotted this map over on Alan Bedenko's site this morning, Buffalo Pundit. The line that divides the city in half, Main Street is clearly visible in this graphic depicting listing prices for Buffalo's residential real estate. There seems to be another corresponding economic development that divides Buffalo. When you consider the recent HUD/Postal Service data that I've collected here - Unstoppable? - and more recently here - Block by Block - there's a similar line down Main Street that impacts the lives of people here in Buffalo, NY. More Numbers - "Not Pretty"
I received the updated 2007 census numbers from LISC Buffalo the other day. In this spreadsheet you'll find the numbers for all the cities and towns in Erie County. The 2000 census is used as a baseline for comparing what in all but three cases is a continuing downward spiral. Remember, Erie County is the second oldest county in the country - by demographic - and in a county with the worst bond rating in the country, are there really any surprises here? Like to know. I stopped by Transfiguration Church at the corner of Sycamore and Mills the other day and noticed some amazing changes. 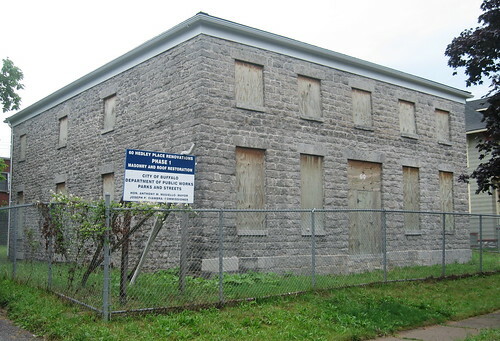 fixBuffalo readers may remember my earlier position about this long neglected architectural treasure which is detailed in the Transfiguration archive. Even though the efforts to seal the church from the elements have taken considerable time, I believe it's important to recognize the work that is being done here. 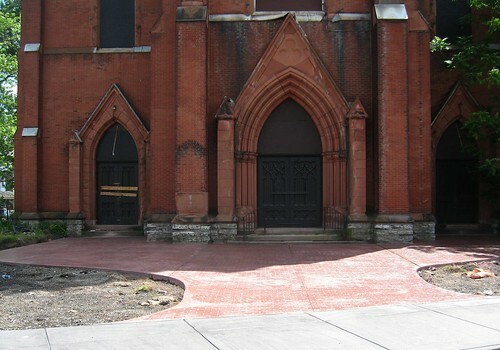 We noticed the new concrete work in front of the main entrance on Sycamore Street. The decades old sidewalk barriers have been removed and the 'urbex' basement entrance is sealed All the openings on building's slate roof have been sealed, too. This is the sort of progress that's necessary and most welcome. Bill - Thank you. Recently Chuck LaChiusa from the Landmark Society passed along the following map. As you can see there's a large cluster of exisiting cultural assets in this neighborhood that include many places that I've featured in the past. Click on a 'pin-point' and see what's here. A map of properties targeted by Buffalo's Midtown Renaissance Project. 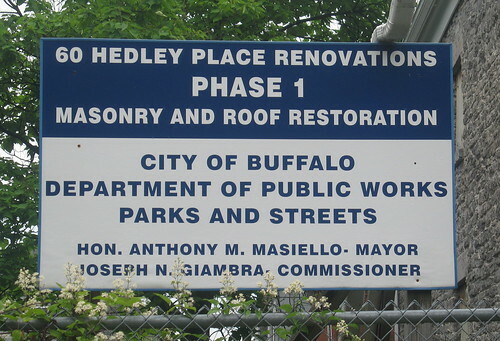 The Project is an effort to jump start housing rehabilitation in a neighborhood on the fringe of downtown Buffalo that has significant public and private investment (ArtSpace, City Honors School, Performing Arts School) and undervalued housing with construction quality no longer available to the middle class. 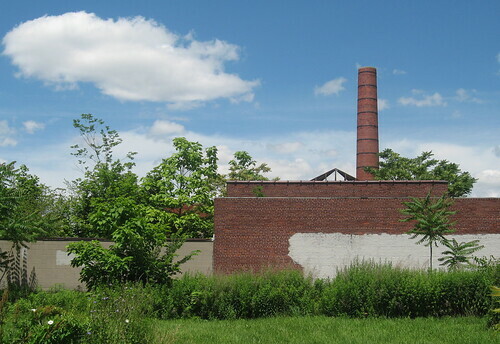 While the urban 'density' of this neighborhood continues to thin, there are a number of City owned residential properties that have been identified as ideal rehab candidates. Here's the Midtown Renaissance Project overview that the Landmark Society is committing itself to. Stone Farm House - ??? Earlier this afternoon I checked on the Stone Farm House over on Hedley Street, a block away from Buffalo Mayor Byron Brown's residence. I first posted about this last September - right here. 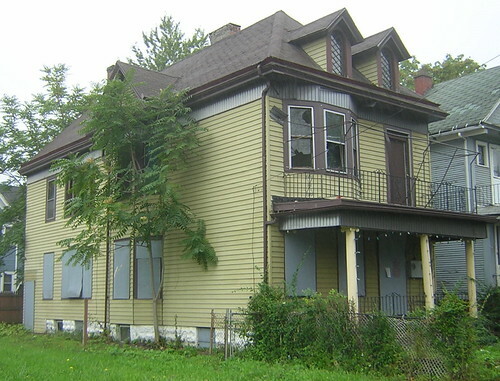 According to the City's website, the City of Buffalo has owned this two-family house for the last ten years. This stone farm house is located in the middle of the City's largest preservation district - Hamlin Park. So, if any fixBuffalo reader has additional information about this project that's been abandoned now for the past two years, I'd really like to know. Of course the other city owned house in Hamlin Park is 16 Harwood Place. Really amazing. Last week I pedaled to the end of my street and visited the site where Mayor Brown announced the latest housing development for the country's second poorest city. As reported by BuffaloRising - Real Estate Reincarnation - the cost of four new 'suburban style' houses with 'west coast eclectic' design will be built at the very end of Woodlawn Avenue at Kehr Street at a staggering cost of 4-5 million dollars. Here's the story that appeared in Wednesday's Buffalo News. When the demolitions are finished, work will begin on four “West Coast suburban-style” homes that are being built by the development arm of True Bethel Baptist Church. The project represents the type of coordinated development that is being linked to demolition blitzes in many other parts of the city, Brown said. Our newest 'suburbs in the city' location is circled in blue. 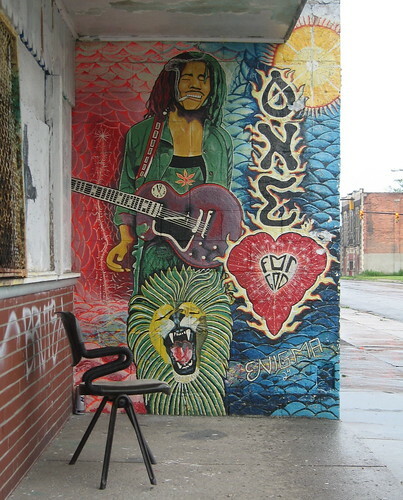 Aside from a politically connected pastor's church and related business - which I've supported and praised here, from a September 2006 Wall Street Journal article - there are no cultural or community assets in this neighborhood. In fact the exact opposite is true. 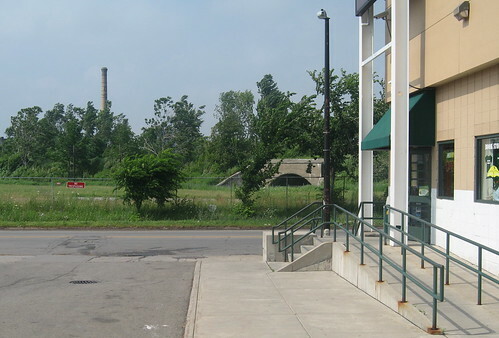 Directly across the street from the church is a former lead smelting site (green location) and one block further away is the location of a soon to be announced EPA superfund and toxic site - the former Houdaille Industries location on Northland which just happens to be owned by the City of Buffalo. The church and Subway shop are located here, directly across the street from the area outlined above in green. Certainly a clustered approach to demolitions here is a good idea. This grouping has been beyond derelict for years. Yet the insanity of building new houses in this location isn't being questioned. 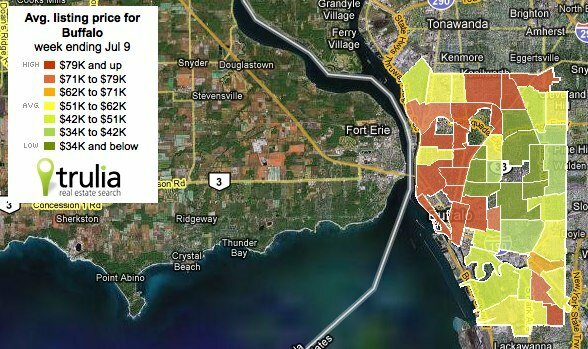 At least one fixBuffalo reader has shared that part of the financing package will most probably include various loan guarantees backed by the City of Buffalo. The eight houses that will be demolished are pictured here in this following photo set. While the true costs of single home construction at Sycamore Village are running in excess of 200K - not including the cost of litigation and site remediation - the sale prices are substantially less, in the range of 120-130K. I'll start digging around and looking into this project. Bottom line here is that we have to be strategic. The scatter shot approach to building a city that's sustainable simply will not work. It hasn't in the past. Is there any reason to believe that it will here with this project? I'll be following this development and hope to have a site plan and architectural renderings soon. Stay tuned. This should be interesting. I pedaled by the remains of 115 Northampton Street today. 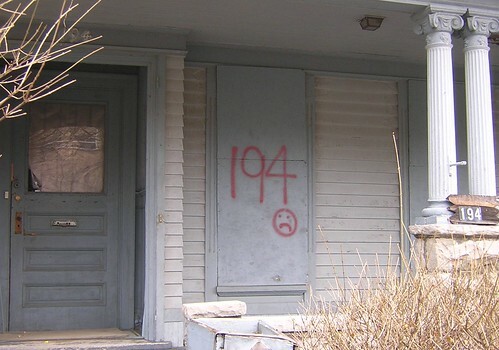 This house was owned by the City of Buffalo since 2005. It sat square, had a seven year old roof and was located just around the corner from Artspace. Certainly this 3/3 double needed lots of work yet it was strategically located and a 'place maker' on the street. It never should have been demolished. I first mentioned 115 Northampton here, two years ago. This is what it looked like then. 115 was an impressive part of the Artspace Backyard Tour, too. So why the demolition? Why now? Certainly places like this should be moth-balled and saved. While I've mentioned repeatedly, a certain level of triage has to be embraced on a practical policy level, as we simply can't save everything, places like 115 need to be set aside while the market catches up and/or the property can be properly marketed. 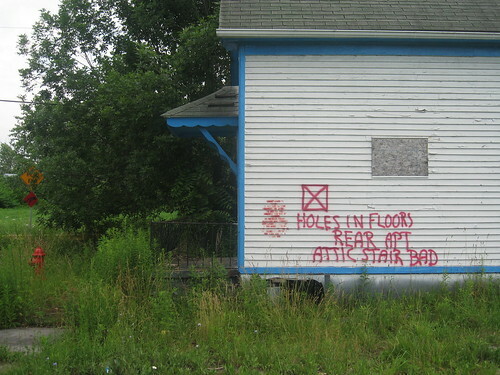 A proactive Division of Real Estate Dept. would help. "For Sale" signs and some web presence would be a good first step. 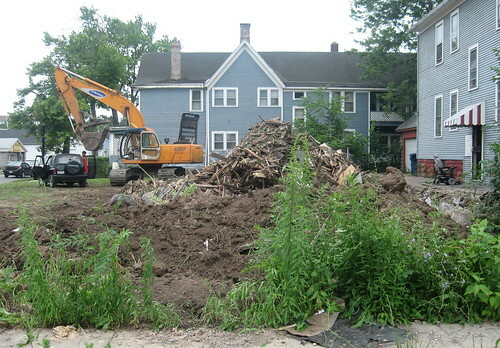 After reading the three part Buffalo News series on abandonment, demolitions and vacancy I went over to Ruhland Avenue (google street view) on Wednesday afternoon. I spent three hours talking with residents about the series and some of the problems they face living in this neighborhood. I'm a supporter of sustainable development that near the core - Main Street - or surrounding a nexus of existing and viable long term cultural and community assets. On Ruhland there is nothing. Residents recognize this, too. After some of the most candid and spontaneous conversations involving the intersection of race and economics that I've had in a long time, I learned that the residents of Ruhland Avenue that I talked with are all on the same page...they'd prefer to move than stay where they are. The rational, text and the blueprint in how to get from here to there and how to transition from the abandoned and dead neighborhoods to an urban vibrancy have been clearly identified. They've been spelled out - Getting Smarter about Decline - and a growing set of 'best practices' is readily available. I'm not certain what sort of modeling or metrics need to be used to determine which neighborhoods need to shut-down in our city - streets, sewers and sidewalks simply removed - at first blush it seems as though this street would be a good candidate. 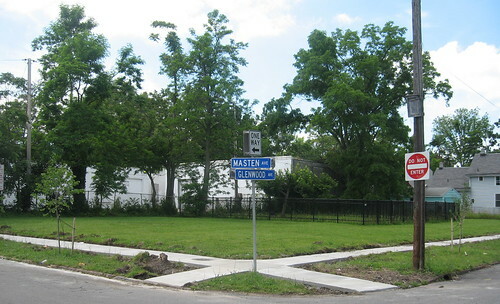 There are seven one block streets in the immediate area bordered by the CSX railroad lines and Sycamore Avenue. This includes one block sections of Oberlin, Gittere, Titus, Ruhland, Miller, Goodyear and Koons. In total there seem to be 100-150 houses in this neighborhood. I'll be returning to the neighborhood soon and completing an informal 'vacancy survey' of existing structures. I'll matrix my findings through ownership records and determine which houses are owner occupied and which are owned by the city. I just looked at live and google maps images for the area. Those seem to be years behind the reality of the situation on the ground. I noticed this auction sign here on Ellicott Street the other day - 1059 Ellicott (google map). This two family house is located one block from Artspace and just around the corner from Coe Place. If you're interested in living in this emerging neighborhood - a block from transit - this is a great space. Here the conditions, details and terms of the July 19th auction. Cash Cunningham - owner of St. Vincent's, less than a block away, is the auctioneer. Frequent fixBuffalo readers may remember this story - 7/Day...1 Every Three Hours - from June 2006. Well yesterday's Buffalo News article about the hemmoraging of the City's population repeats the news that is becoming increasingly more familiar to Buffalo's residents and visitors. Here's the story. The growing commentary in the related B/N blog post is important to read, too - right here. The City of Good Neighbors lost 2,552 of those good neighbors between July 1, 2006, and July 1, 2007 — a 0.93 percent decline. Let's see...that's the same rate of loss that we've been experiencing for the last few years. Still, 7/day. Do the math. If a bus load of people leave every week and a car load of people return - where's the trend? If you don't want to walk, drive or ride your bike through the neighborhoods and see the 'hollowing out' and the vacancy - what happens when people leave the area - just check out this recent story - Unstoppable? - and you'll start to get your hands around the problem. When people move, houses are left behind. Houses stay vacant and eventually are trucked off to a landfill. See google's lastest - street view, Buffalo - and scroll over to the City's east side to take a look. I've recently heard a number of people suggest by 2010, when the next census is completed, this part of the planet may lose yet another congressional seat. Some even speculate that Buffalo may slip behind Rochester and become the state's number three city. Byron, what's the plan? Hope? Block by Block...more bad news! The shredded urban fabric of the country's second poorest city is becoming visible for the whole world to see. 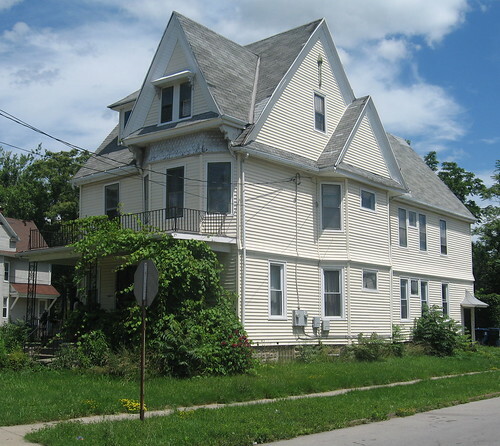 Today's article in the Buffalo News - Neglected Homes and Vacant Lots - is the first in a three part series. Here's the B/N blog post. 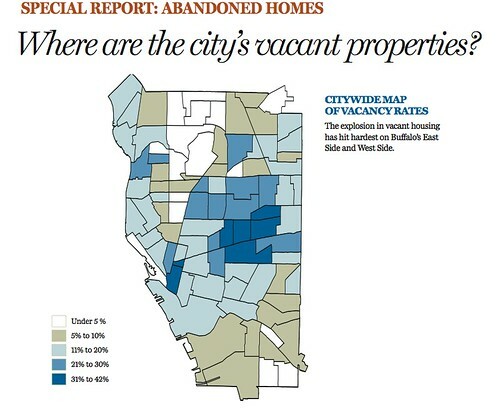 The Buffalo News has also compiled a useful vacancy data base - street by street - showing the extent of the decay. Staggering! If you're reading this blog for the first time, make sure to check out the following posts - Unstoppable? and Al Jazeera comes to Buffalo. Sometimes I wonder if our Mayor has ever thought about visiting Youngstown, OH - see, Learning from Youngstown - where Mayor Jay Williams understands what needs to done when half a city collapses before your eyes. 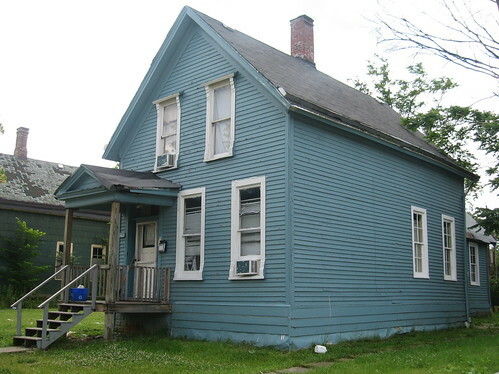 This single family home, located at 165 Glenwood Avenue is for sale. One of my neighbors has owned the house for the past 10 years and is interested in holding a small mortgage for the full sale price. It's a four bedroom house, assessed at 12K. It's located on the Queen City Farm block. 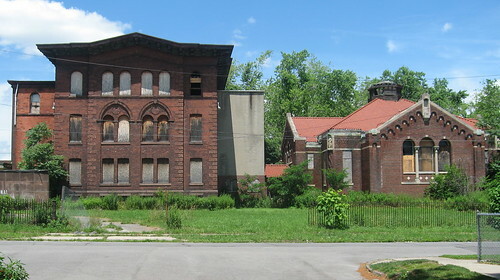 While vacancies and the rate of vacany are increasing in most of Buffalo's neighborhoods - see, Unstoppable? - i've found it fascinating seeing the various notes city inspectors leave behind. 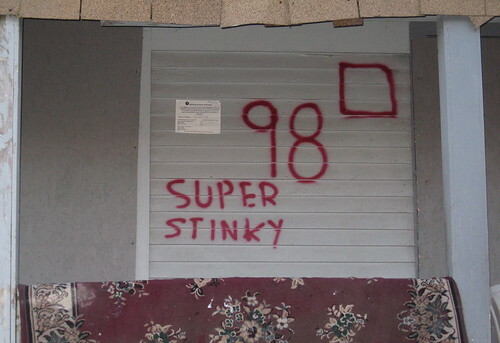 Once a building is sprayed with the 'red mark of death' other people sometimes leave notes, too. Here's the slide show. This shot is from 194 East Utica, prior to the formation of the Queen City Farm Project. I'll be adding to the series. Interesting moment as our City is trucked away to a landfill in Ohio - right here. A fixBuffalo friend has recently encouraged me to begin documenting another aspect of the city, street art. Here's the first installment of an emerging series of street scenes, projects i drive by everyday and have just begun to see. Here's the show. These pics and projects are from the City's east side. If you've seen others, let me know. I'll keep this series going. We learned this past week that the tax-credit financing for the proposed St. Martin's Village, failed. Some of the commentary in a rather hopeful post that appeared a day before the financing flopped is important to read, if you haven't done so already - right here. 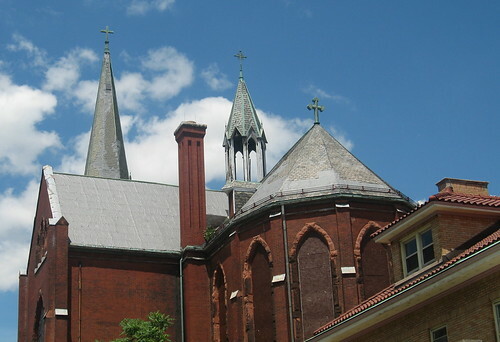 Since 1874 this site has also been known as the German Roman Catholic Orphan Home. See this archive for additional information. 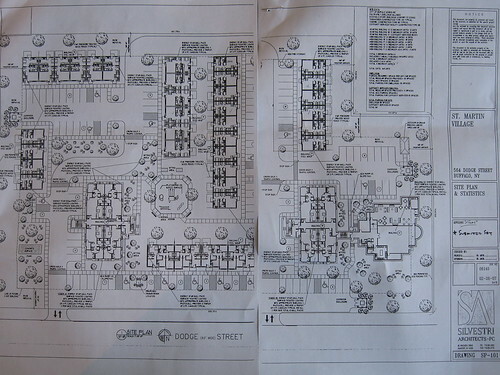 Last month I received a copy of the (now failed) proposed site plan in the mail. Here's the rendering. I've linked to the plan's text in the smaller pics. 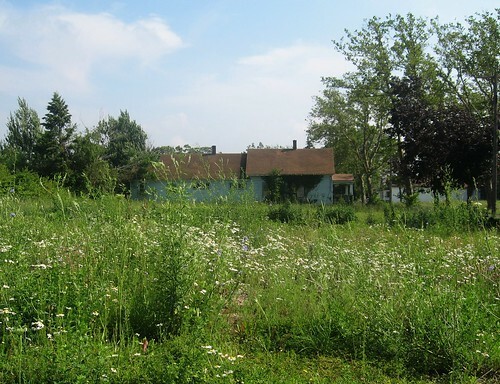 One of the major problems here is that the Community Action Organization of Erie County has lacked the capacity and willingness to simply the secure the site, for the last five years. Lots of promises, no action. It's of course no surprise that politically connected organizations such as this are immune to Judge Nowak's Housing Court. The place is wide open, crumbling and quickly becoming the latest victim of this city's curse - 'demolition by neglect'. Since acquiring the property in 2003 from NY Liberty Homes LLC - the organization run by Houston based Scot Wizig - for $1 as part of the City's settlement, the CAO has managed to do nothing to the place, save mow the lawn on occasion. Yesterday I spent some time at the former German Roman Catholic Orphan Home - see archive for additional writing about this place - took some pics and compiled this slide show. Really sort of wild, welcoming and forbidden place all at the same time. I remember meeting a former resident, an orphan who left the place when it closed in 1956 after a devastating fire. He hadn't returned in 50 years when I met up with him two years ago. He showed me traces of the fading line along a few of the buildings in the rear yard, a line that separated the boys and girls. Two years ago Toronto based DK Photo Group arrived in town and explored the place photographically, see slide shows. Sean, from DK, compiled the above map of the site for the October 2006 show in Toronto. This 1915 map is a snapshot of the same area. The loss is staggering, especially when you compare that map with this recent satellite view that shows the proximity of the Buffalo Museum of Science across the scar. As the 19th century fabric of this city continues to disappear at an ever increasingly faster rate, one wonders how much longer this catholic complex will last or if an invitation to Housing Court is even on the horizon. I'm remembering that boy/girl line that Ralph showed me two years ago. Today there are fewer lines. When you cross over from the side walk, bring a friend. In the country's second poorest City buildings collapse and are demolished on a regular basis. Check this one out, before it's gone. This neighborhood is continuously changing. 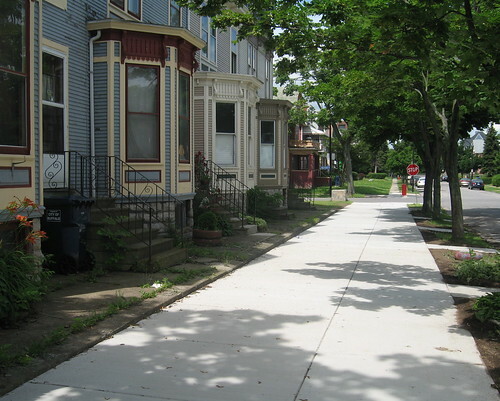 This past week new sidewalks were installed along Woodlawn Avenue, double wide ones in spots. The construction continued around the corner on Glenwood Avenue. 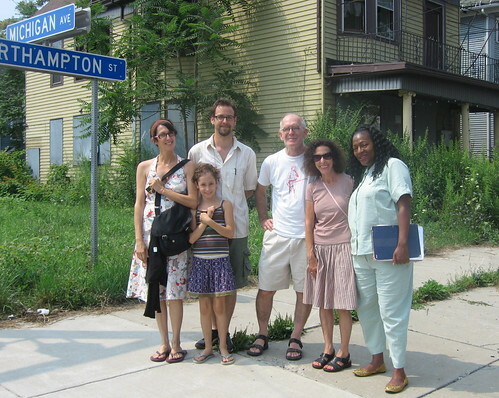 fixBuffalo readers may remember the 150 trees that were planeted in the neighborhood recently. New school, too! Animal Resuce - Here's Lucy! While taking pictures this morning i spotted Lucy tied to a fence near an abandoned house in the neighborhood. 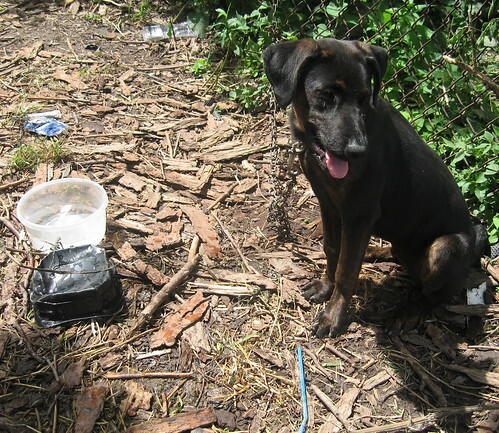 She'd been here for days, without food or water. I went over to see the McCallums who moved in last week and picked up some water. fixBuffalo readers will remember the McCallums from Queen City Farm. Meagan helped me track down some temporary housing for Lucy later this afternoon. 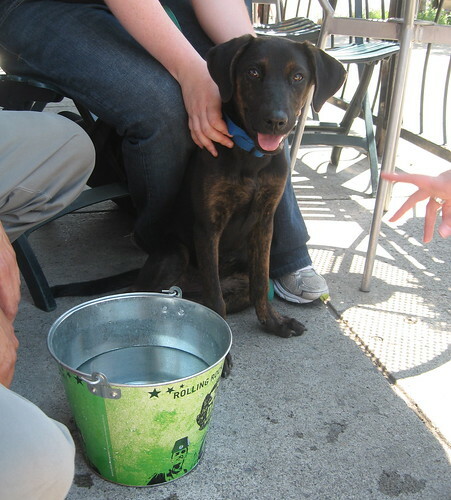 Lucy has a fine disposition for a young pup, probably a shepard/rottweiler mix. While she was really skittish at first and afraid of being touched, by this evening Lucy was rolling around having a great time with kids. So...we need to find a permanent home for Lucy. If you're interested in taking her to the vet and getting her checked out and/or finding a permanent home for her, please let me know. Update - 7/5/08 - 3pm. While sitting with friends at the cafe, moments ago i spotted Lucy walking down the street. Happy to report that Lucy now has a permanent home.